Linda Wallheim is the mother of five grown boys and the wife of a Mormon bishop in the heart of Utah. Linda's unofficial job as bishop's wife is to support her husband and act as the de facto mother to the ward. But when people of her ward are in danger, she cannot suppress her misgivings about the church's patriarchal structure and secrecy any longer. Once again pulling from the headlines, His Right Hand tackles an extremely contested topic within the Mormon community--transgenderism. Mormon bishop's wife Linda Wallheim fears for the safety of the people in her community when Karl Ashby, the ward's second counselor (the bishop's right-hand man), is found dead in an elaborately staged murder. Linda tries to console Karl's grieving children and wife, but matters are complicated when the autopsy reveals that Karl was a biological woman. 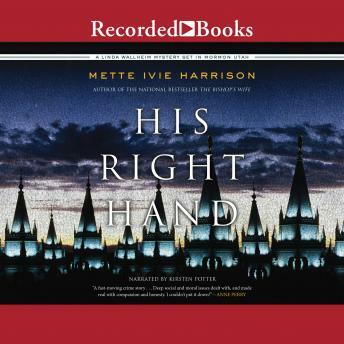 Harrison's work continues to present us with a unique insider's glimpse into the lesser-known workings of the Mormon faith and community. Mette is steadily establishing her name in adult crime fiction as she attends conventions around the country. The Bishop's Wifewas a national bestseller, an ABA IndieNext Selection, and a PLA LibraryReads Top Ten Selection. "Linda is a fascinating character . . . Her ties to both her family and her church are strong, but she is not beyond questioning her deeply held beliefs when necessary." --Booklist, Starred Review Mette Ivie Harrison is the author of numerous books for young adults. She holds a PhD in German literature from Princeton University and is a nationally ranked triathlete. A member of the Church of Jesus Christ of Latter-Day Saints, she lives in Utah with her husband and five children. The Bishop's Wifewas her crime fiction debut. Marketing and Publicity Strong LGBT angle which will augment the women's interest, mystery and LDS angles that we used successfully for THE BISHOP'S WIFE. $45,000 marketing budget. Pre-publication digital/print advertising across trade venues. Multi-stage consumer digital/print advertising. One month out and on pub, commercial and mystery publication focus. Featured galley at ALA Annual and BEA 2015. Facebook and AdWords advertising. Consumer-facing pre-pub galley distro via Goodreads. IndieBound White Box mailing. I'm LDS and this story was compelling to me. With todays world and the changing of the world, this was a great topic to put in a story. I felt bad true love was killed in the sense of the two main characters. I thought it was neat that you realize that the bishops wife is apart of this book. awesome! !